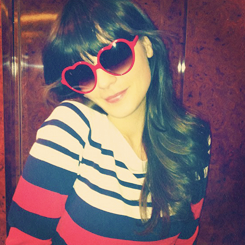 Zooey Deschanel is one of the celebrities that make me wish I was like her, or at least I had something like her in me. she inspires me in different ways, i mean i don't know her personally or neither have I done that much research on her but there is just something that makes me like her. She is just so cute and i love her hair and I Wonder if she is like the characters that she has played. i like weird and i like weird people and weird things. 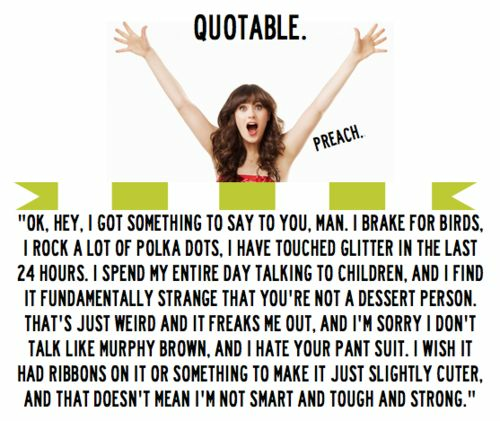 so maybe this makes me like her, specially in New Girl. i think this is the only word i can describe her. casual photos, but whatever pose SHE makes, makes her look even cuter..
She has these lovely hair, her hairstyle is usually glossy waves and straight bangs that suit her totally. and these amazing blue eyes i love so much! her dresses have these cute girlishness and bows and laces and ribbons that i adore! her dresses are usually a line and her makeup is usually natural with pink cheeks. Love her glitter shoes here, I am totally gonna make some shoes like these pretty soon, since i have holidays now.